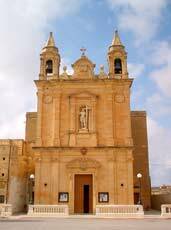 Munxar, was the last place in Gozo to become parish and, as a result, an autonomous village. Its name is Maltese church sawing into two the surrounding area. Beyond the church, a road leads to Ras il-Bajjada and then to Xlendi. The area regales the visitor with some breathtaking views over open sea and is ideal for relaxing walks, for bucksaw, a name suggested by the promontory that runs from behind the village. MUNXAR lies on the very southern tip of Rabat. The church of Munxar was built between 1914 and 1925. Its foundation stone was laid on 2 February 1914 and it was consecrated on 18 October 1925. It was established a parish by Bishop Joseph Pace on 12 December 1957.